If you have two- to four-year-old family members in your house, I don't need to tell you what inquisitive, imitative, and curious people they are. They love to explore, to "help" mommy and daddy do their work, and to participate in everything just as if they were grownups. The highest compliment you can pay toddlers is to call them "big" and let them do things for themselves. Two new software packages for toddlers, McGee and Katie's Farm from Lawrence Productions, cater directly to the needs of youngsters age 2–6. These delightful computer experiences for wee ones contain no written words whatsoever. They put the children in complete charge of the adventure and let them explore on their own as long as they want to. In short, it's computer heaven for small fry. McGee is the two-year-old star of both games. 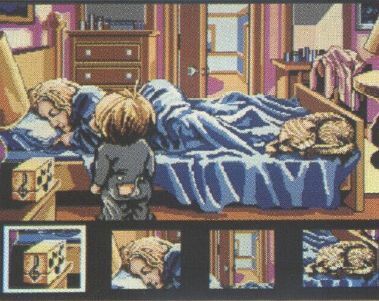 As the game McGee opens, the star wakes up in his small bed, gets up, and faces into his room, where toys await his attention. The animation stops while the computer waits for your child to make a choice. 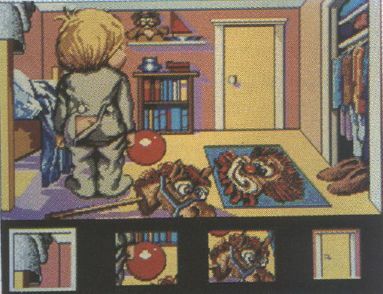 Look at the screen shot of McGee's room, with its four large icons across the bottom of the screen. One is highlighted by a thick white border around it. Moving the mouse to the left or right moves the highlight to the next icon in that direction. Click the mouse button to choose an action. Teaching your toddler to use the mouse in this way is a snap; it's a natural way for even a two-year-old to run the computer. Mouseless computers can use the program, too; the arrow keys move the highlight and the Enter key or space bar chooses the action. The mouse, however, seems to be easier for the very young. Your child clicks on an icon at the bottom of the screen to choose an action. In that first screen, the four icons are the bunny-rabbit hand puppet, the red rubber ball, the hobbyhorse, and the door. Click on the puppet and a new screen appears in which McGee plays with the puppet, talking to it and moving its arms. Choose the ball and he bounces it against the wall, accompanied by appropriate sound effects. Select the hobbyhorse and he climbs on it, shouts "Giddyap," and canters about the room until the horse finally stops at his shouted "Whoa!" Choose the door and your next screen is the upstairs hallway, where McGee faces a choice of three doors—one goes back into his bedroom—and the stairs. McGee has the run of the house. It's early morning, Mommy is still asleep, and McGee can do pretty much as he pleases. Think of how your toddler will love that scenario. How do we know Mommy's asleep? Go into the door at the end of the hallway and you'll see Mommy sound asleep with the cat curled up at the end of her bed. Click on the icon of Mommy's face and McGee walks over to her and says "Morning, Mommy." A sleepy eye opens and contemplates her son briefly. "Good morning, McGee," she replies, and goes back to sleep. Now McGee knows he's free to do as he pleases. If he's still nervous about Mommy's staying asleep, he can play the music box. After a minute, Mommy's eye opens again and she asks him to turn it off. Then she's asleep again. It looks like clear sailing. McGee has a lot of places he can go. There's the bathroom, where he'll take a bath (demurely behind the shower curtain) and brush his teeth. Then there's the toilet icon. When you click on that one, McGee turns to you with a wry expression and points out into the hallway. Your point of view shifts to the hallway, the bathroom door closes, and soon you hear the toilet flush. Then you're back in the bathroom to make a new choice from the icon panel. Downstairs is the living room, where McGee can crawl under the rug, watch TV, or go into the kitchen. In the kitchen, he can feed the dog, make a phone call, or go into the fenced back yard, which offers a dandelion, a tire swing, and a knothole in the fence to look through. I have mentioned every screen and action in McGee. An adult will take only ten minutes to explore everything McGee can do. An adult will enjoy the quick tour and admire the excellent graphics, the sound, and the cleverness of the ideas involved. An adult will think McGee and Katie are as cute as their own toddlers. An adult will miss the point entirely. Little tykes will see it with entirely different eyes. Remember how often your two-year-old wants you to read that favorite story? Remember endless repetitions of a favorite song or game? Toddlers don't do ring-around-the-rosey once or twice; they do it over and over again, even if nothing changes. And so it is with these preschooler's games. They go with McGee all over the house and play with the toys and make phone calls again and again, delighting in the actions each time. The little ones also find things you missed when you went through the house with all your grown-up wisdom. Did you think to look out the knothole in the fence more than once? If you had, you would have seen an apple fall out of the tree across the street the first time. The next time, you'd have seen the neighbor's dog run by. The kids love the feeling of control. They decide what to do and make McGee do their bidding. They don't need adult help; they're in charge. There's great excitement for toddlers who can say, "I can do it myself!" They also like using the computer, doing their "work" with it just the way Mommy and Daddy do. And they love to share their experience—as long as they remain in charge. Sit with your child on your lap to play the game. You just watch, and soon your toddler will be telling you all about what's going on, making up a story to explain the actions. Educators tell us this kind of activity helps develop verbalization and socialization skills. The kids also enjoy discussing the choices they make, their favorite actions, and the funniest parts. These games provide a welcome opportunity for you to have a happy one-on-one experience with your child. 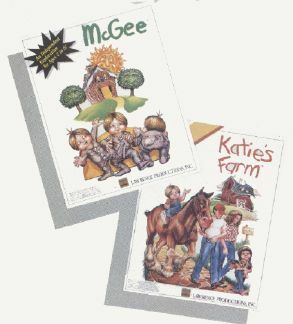 Katie's Farm is the second game in the series. McGee visits his cousin, Katie, on a farm. Richer than the first game, this one has more choices and more speech; and almost all the actions have more than one outcome if selected repeatedly. Clicking on the old tree even gives you three different animations. Of course, it takes up more room on your hard disk as a result (a total of 1.04MB, as opposed to McGee's 865K), but it's certainly worth it. The graphics seem even better, with more vibrant colors and more detailed scenes. While mommy sleeps, McGee has the whole house to himself to explore. McGee explores rural life as he visits cousin Katie on her family's farm. 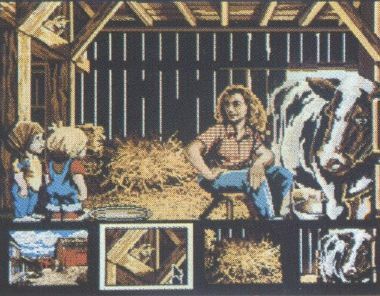 On the farm, the two cousins have a glorious time exploring the barn and chicken coop, fishing in the lake, playing with the scarecrow, picking berries (which McGee eats instead of gathering into his bucket), riding the horse, and more. There's so much to explore on a farm! There's one drawback to these games, at least in the IBM format: the sound. Without a sound board (the games support the Covox Speech Thing, Sound Blaster, and Tandy sound), some of the sound effects are less than effective—and that's being generous. The speech and music come through quite acceptably, but the other effects come out in rough blasts of guttural electronic tones, suggestive of someone funneling large-grain gravel into a tin bucket. The IBM insert to the manual suggests you may want to turn off the sound during the installation and enjoy the games without sound. Don't do it; kids love noise for its own sake, especially if it's noise they control themselves. They don't care if that chainsaw noise really should be the sound of McGee brushing his teeth. With the sound board, however, the sound effects are excellent, adding considerably to the enjoyment of the games. If you're into games at all, you need a sound board anyway. These games come by their understanding of kids and the educational process naturally. Lawrence Productions started 20 years ago with filmstrips. Specializing in educational media products, it now makes interactive computer programs as well as videotaped instructional materials, primarily for the elementary school market. One day the director, who was working with preschoolers, came up with the idea of a no-words program for toddlers. The artists loved the idea, the educational theorists knew it would work, and they all developed a new excitement about their work. It shows in the product. These games are not production-line "educational" products; they're art, made with love. If you've got a little McGee or Katie enlivening your life, you can finally share the joy and wonder of your home computer with them, bringing them into the family circle that may occasionally gather 'round the computer. Give them their own adventure game, their own exciting experience with the computer. Give them McGee and Katie's Farm. 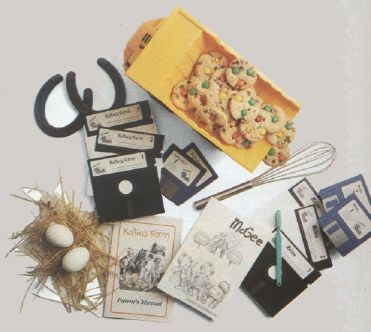 Packages include manuals, two 3½-inch and three 5¼-inch disks. Not copyprotected.